Historically, sign makers have used great creative license. So much so that I have even known a few who seemed to view correct spelling and punctuation as suggestions rather than rules. Perhaps this is why some designers in the print field have tended to look down on sign designers. But as the distinction between the print industry and the sign world continues to blur, I believe that we sign goobers should at least know some basics of proper punctuation. How can we hope to break the rules if we don’t even know them, right? The typical keyboard layout, a holdover from typewriter days, does not have a key for an apostrophe. It does have a key for a single vertical hash mark, often called a prime, though a true prime is slanted. The hash is often used as a replacement for the prime, meaning “feet.” On the same key as the hash is the double hash mark, used for “inches” in place of the double prime, as in the phrase, 6′-2″ (six feet, two inches). The single hash mark is not an apostrophe and the double hash is not a quotation mark. And while it’s one thing for a sign designer to make a stylized apostrophe in the main line of copy to add some flair to a sign, to use hash marks as apostrophes or quotes in body text is amateurish. These hash marks are often called “dumb quotes,” and with good reason. To use them in text as substitutes for quotation marks or apostrophes, especially on high class signage, such as, say, cast bronze plaques, can make the sign maker look inexperienced. On a PC, the apostrophe is accessed by the keystroke combination, ALT 0146. Yes, it’s five keystrokes instead of one, and, for some of us, the extra typing time required may eat away at an already thin profit margin. But that may mean it’s a good time to raise prices. Another mistake to avoid is to use the apostrophe when forming plurals. An apostrophe almost always means possession, not a plural. “CAR’S FOR SALE” is wrong. Even “ALL 2015’s FOR SALE” is wrong. No apostrophe should be in either. And when you form the plural of an acronym or an abbreviation, there should be no apostrophe. Accountants are CPAs, not CPA’s. Only in rare cases should an apostrophe be used to form a plural. —see the Chicago Manual of Style. I know that customers will rarely object to hash marks used as apostrophes. But there are customers who would not object to misspelled words, either—because they might know correct spellings themselves. That is not a good argument for misspelling a word intentionally. And once in a while you will actually come across an architect who makes an issue of punctuation on sign woerk. I remember an architect who rejected page after page of submitted drawings for interior signs for a hospital because we used hyphens instead of dashes on room number signs. Phone numbers in the US are typically typeset with hyphens, not dashes. Hyphens are short dashes (or long periods) and are used for words that are split on two lines, and for phone numbers, or more correctly, numbers that are not in a series. Numbers in a series, as in the phrase “Rooms 210–215” require a true dash rather than a hyphen, specifically, an ‘en dash.’ An en dash is considerably longer than a hyphen. 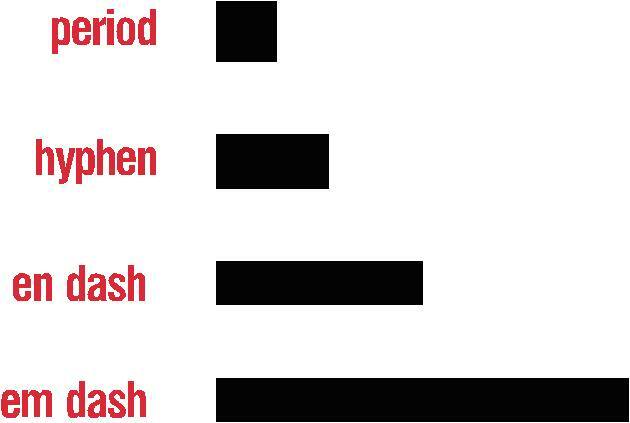 Even longer is an ‘em dash,’ which has several other uses. Hyphens in phone numbers do have their down side. They are sometimes difficult to space with certain numbers, like sevens. A bullet or a dot is a little easier, and allows for tighter phone numbers, too. A common problem with hyphens is that its correct placement is not understood. Most design software, by default, places it just below vertical center in a phone number. This is very unsightly. Worse, it looks correct to many people because it has become so common. In reality, this placement is the default lower case position. The appropriate location for a hyphen used with capitals or numbers is the vertical midpoint of the letter or number. —see Finer Points in the Spacing and Arrangement of Type, by Geoffrey Dowding, an instructional for typesetters. I ungroup my phone numbers and force the hyphens to vertical center, aligning them with a zero or some other vertically centered number. It’s true that it takes a couple of extra steps to tweak a phone number this way. It’s certainly not for a knock-out artist. But it is, I believe, a mark of good craftsmanship. The use of dots in phone numbers has been in use in Europe for a long time. It has been in use more and more in the US. Some think it’s way cool, some think it’s pretentious. I don’t mind it, though I don’t volunteer it much. It still looks like a phone number and that’s what counts. In UK sometimes phone numbers are written without any punctuation at all, like this: 020 7123 1234. And I’ve also seen the first three digits, their area code, with parentheses, like this: (020) 7123 1234. The first example, with only spaces, looks like some secret agent cipher to me, but I guess I’m just used to punctuation of some sort in a phone number. If you don’t like hyphens, periods or parentheses, there is a ‘middle dot’ you can get to by typing ALT 0183 on a PC keyboard. Slashes are used by some in place of hyphens. A solidus is similar to a slash, but leans to the right more. It’s mostly used in fractions. By the way, a backslash leans to the left, like a reverse solidus. You could get wild with asterisks instead of hyphens. Or stars, or even flowers. A romantic phone number could have hearts. I apprenticed as a sign painter in the ’70s at a shop called Super Signs. Their logo looked similar to the Superman emblem. The owner of the shop regularly used gem shapes instead of hyphens in phone numbers. I thought this was so clever that I did it habitually for years after I left the shop to go out on my own. It was my hat tip to my mentor. If you don’t like any of the above in phone numbers, you can always use everybody’s favorite—bullets.